A bunion is a foot condition that most people may not be familiar with unless they happen to suffer from one. A bunion is a bump that forms on the toe joint – usually the big toe joint, which is technically known as the first metatarsophalangeal joint. A bunion often causes a characteristic red, swollen bump on the top or side of the joint and results in a widening of the forefoot (toe area). These changes not only cause pain, but they make shoe wear difficult due to the widened forefoot and can create cosmetic concerns. Even though a bunion usually develops on the big toe side of the foot, another area where a bunion can occur is the pinkie toe side. This type of bunion is known as a bunionette, or tailor's bunion. This foot condition came to be known as a tailor's bunion from the notion that tailors often sat in a cross-legged position while they worked, putting pressure on the outside of the foot. It was thought that this chronic pressure led to the development of the characteristic bump. A tailor's bunion is a condition that progresses gradually, usually beginning with a prominence, or bump, over the side of the fifth metatarsal bone. This is the area where the pinkie toe forms a joint with the long fifth metatarsal bone. The bump can increase in size over time, causing pain and making it difficult to find shoes that fit well. The chronic rubbing of the bump against the shoe can also cause the skin in that area to become red and irritated, sometimes even leading to a skin callus. Swelling and pain in the area of the bump can also occur. These are signs of bursitis, which is an inflamed pocket of fluid. A bunion sufferer will also notice that their foot appears to have gotten wider. This widening occurs because of a gradual separation of the fifth metatarsal bone from the fourth metatarsal bone that lies next to it. This separation of the metatarsal bones is a root cause of the bunion and is a consequence of abnormal foot function. What Causes a Tailor's Bunion? Abnormal foot function is a common cause of a tailor's bunion. The foot is a complex, shock-absorbing structure with many joints. If there is excess motion in one part of the foot when stability is needed, changes in foot structure can occur. The gradual separation between the metatarsal bones that leads to a bunion is an example of this. Other causes of a tailor's bunion include a hereditary, abnormal shape or position of the fifth metatarsal bone, as well as tight-fitting shoes. Interestingly, tailor's bunions occur much more often in women than men. One reason for this is thought to be women's shoe-wear -- specifically, high heels and pointed-toe styles, which negatively affect foot function. Non-surgical care of a tailor's bunion may involve procedures to relieve pain or reduce any abnormal foot function that has been identified. 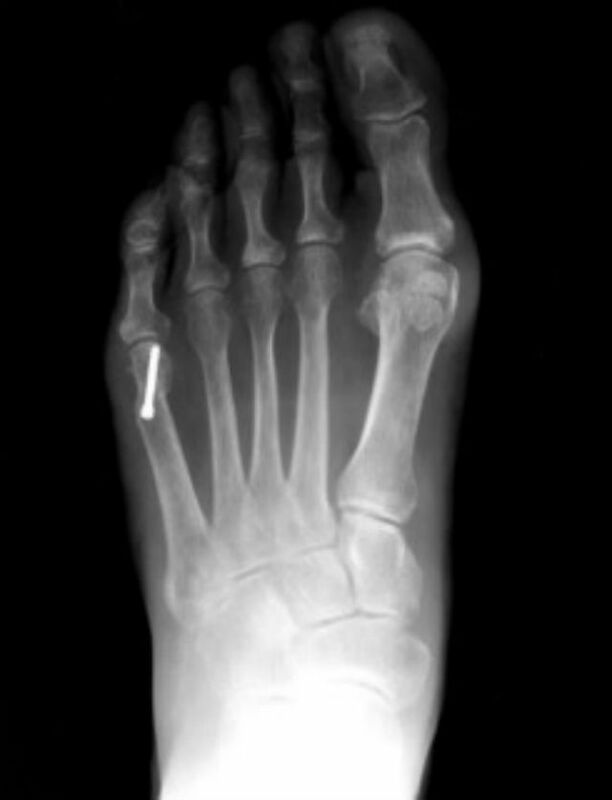 An X-ray or other imaging study may be prescribed to evaluate the fifth metatarsal. Pain management may involve a cortisone injection if bursitis (swelling) is present. Any calluses may be shaved off (a procedure known as debridement) for additional pain relief. Orthotics, which are specialized arch supports, may be recommended to treat any problems with foot function. Over-the-counter padding devices can also help with minimizing shoe irritation. Surgery may be an option, especially if there are abnormalities in the fifth metatarsal bone. Procedures may involve shaving the bump or repositioning the fifth metatarsal bone. These surgical procedures involve some downtime afterward but are the only effective way to correct a bunion. Fallat, DPM, Lawrence M. Pathology of the Fifth Ray, Including the Tailor's Bunion Deformity. Clinics in Podiatric Medicine and Surgery. Vol. 7 (4), Oct. 1990. Can Surgery Cause Your Bunions to Come Back?